Nashville, Tenn. (June 21, 2012) – Nashville Predators President of Hockey Operations/General Manager David Poile announced today that the club has signed forward Brandon Yip to a one-year contract worth $750,000. 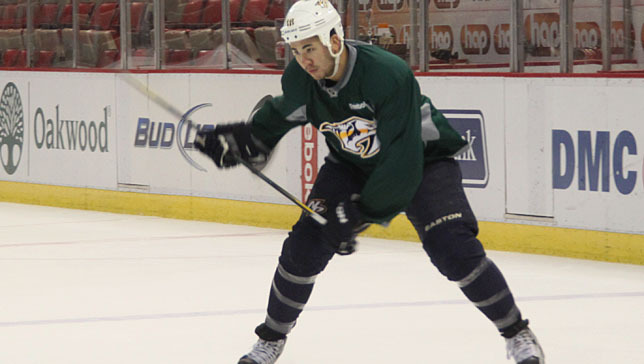 Yip, 27 (4/25/85), was claimed on waivers by Nashville on Jan. 19, 2012. The Vancouver, B.C., native posted seven points (3g-4a) in 25 regular-season contests for the Predators and two points (1g-1a) while appearing in all 10 of the club’s 2012 playoff games. In 138 career NHL games, he has 48 points (26g-22a) and 104 penalty minutes. The 6-1, 195-pound right wing also has six points (3g-3a) in 16 postseason career games. Colorado’s seventh selection, 239th overall (eighth round), in the 2004 Entry Draft, amassed 108 points (45g-63a) in 139 games with Boston University from 2005-09, helping the Terriers win the 2009 NCAA National Championship on a team that also included current Predator Colin Wilson.